Our extended-cabin 2002 Duffy 37, an exceptionally seakindly boat, has clean Downeast lobster-hull lines, classic styling, and a large, bright saloon. But with big windows and 360-degree visibility, the galley-up version has less stowage than other boats of similar size. Duffy hulls are custom built and finished by Atlantic Boat Company in Brooklin, Maine. We bought ours from the original owner. As with all custom boats, you get what the original owner wanted. 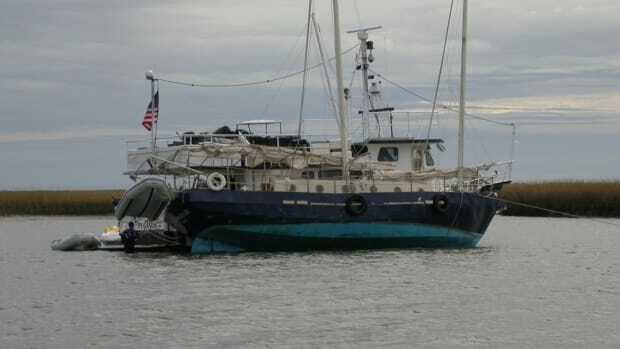 The portside galley has a refrigerator/freezer, microwave/convection oven, and a three-burner stove. Even with two cabinets and three drawers tucked under a 5-1/2-footlong Corian countertop, we found that we needed a bit more storage. 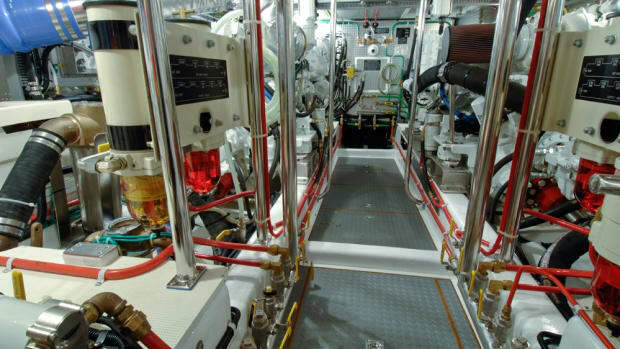 The only spaces available for additional storage were the refrigerator enclosure&apos;s sidewall and the area between the starboard cabin&apos;s side and rear windows. Our saloon is generously finished with teak, including the cabinets, table, helm, nav station, seating, and trim. My plan in expanding our stowage options was to match the boat&apos;s interior finish and style as closely as possible and to use the maximum amount of available space without making structural modifications. I decided to build a louvered-door cabinet with two tall shelves for the galley and a book rack over the settee using teak, which is oily, straight grained, and easy to work with. Finishing teak is simple. Just apply two coats of teak oil and wipe dry! After buying a louvered door and trim frame from a boat supply store, I designed the cabinet around it. A local lumberyard had random lengths and widths of exotic woods in stock. Rummaging through their rough-cut teak, I found a plank nearly 10 feet long and 7 inches wide, two other roughly 4-inch-wide pieces, and a 10-foot-long, 2-inch-wide, 1/4-inch-thick strip. The yard finished the plank into a smooth, 3/4-inch-thick, 6-1/2-inch-wide board and worked the smaller pieces to the same thickness in a 3-1/2-inch width. I used most of the narrower wood to frame the cabinet&apos;s louvered door. The remainder was used for shelf bracing and the book rack&apos;s sides and bottom. For these projects, I found a drill press and table saw to be most helpful, because they ensure the accuracy of wood cuts and the alignment of drilled holes. The other power tools that I used were a 3/8-inch drill and a palm sander. The hand tools I used were a dowel jig, mallet, screwdriver, chisel, various wood clamps, and sandpaper for rounding edges. I pinned together the cabinet&apos;s front face frame with 1/4-inch wood dowels and then glued it and clamped it. The dowel jig ensured accurate pin placement. Next, I cut the wide plank into top, middle, and bottom shelves and the cabinet&apos;s sides. For added stability, I fitted the center shelf into each side using a 1/4-inch deep dado cut. Cross-braces on the rear of each shelf were used to mount the cabinet and add strength. Next, I drilled screw holes with a tapered, countersunk drill bit (Dewalt&apos;s model DE- 2535). For assembly, each piece was joined using Titebond III glue, affixed with brass screws, and clamped firmly until dry. I filled all countersunk holes with 3/8-inch teak plugs at finishing. I assembled the cabinet shelves and sides first, using glue and countersunk screws. Then, I attached the face frame, and then the door&apos;s trim frame. All together, I spent about 15 hours building the cabinet, not including the glue-setting time. (The simple book rack, which I&apos;ll describe next, took less than three hours to complete.) At each phase (attaching the cabinet sides/shelves, face, and trim frames), I let the clamped glue joints dry and strengthen overnight. I finished the entire cabinet and louvered door with two coats of Watco Teak Oil, sold at the specialty lumberyard where I purchased the wood. I use the oil on all of my boat&apos;s teak surfaces. Following the manufacturer&apos;s instructions, I applied the first coat generously and allowed it to sink in for a half hour, and then I applied another coat. After allowing 15 minutes for the teak to absorb the oil, I polished the cabinet using soft cloths, and the rich finish was complete. Finally, I attached the louvered door using two Perko chrome-plated brass hinges and two brass stud catches. Our new cabinet, with its tall shelves, now stores boxed foods, bottles, and various canned items. Mounting the cabinet on the refrigerator enclosure&apos;s sidewall was a two-person task. As I held the cabinet in position, my wife, Kathy, marked each mounting hole with a pencil. Using a 9/16-inch bit, I then drilled 12 holes in the wall, placed the cabinet in position, and inserted the mounting screws. Twelve stainless-steel Phillips oval-head, 1/8-inch machine screws backed by washers and locknuts hold the cabinet tightly against the wall. After reinstalling the microwave and refrigerator, we were done. Kathy has already filled the cabinet to capacity and wants more! Another simple project that garnered us additional storage was building a book rack, a much easier project than constructing the cabinet. Our empty spot on the wall called for a 20-inch-wide unit. After cutting and tapering the sidepieces, I attached each to the bottom with glue, two countersunk screws, and teak plugs. The 1/4-inch-thick strips were edge rounded and sanded smooth and then cut to length for use as front and back slats. During assembly, I attached all slats to the sides and bottom with glue and screws that were countersunk flush with the surface. Each of the rear slats has three countersunk holes for bulkhead mounting. I didn&apos;t use countersunk plugs in the slats because the slats weren&apos;t thick enough. 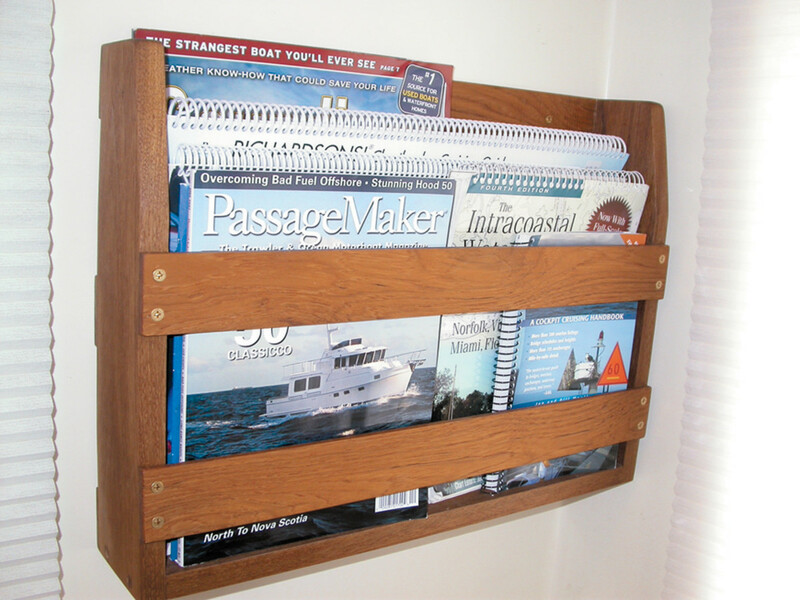 After finishing the book rack with teak oil, I mounted it on the bulkhead. Nine brass screws hold it in place above the settee. Building custom cabinetry is not difficult. Just plan well, cut carefully, and work methodically. My total project cost for both units was only $400: $270 for the wood, $100 for the louvered door, and $30 for hardware. We gained nearly 3 cubic feet of food storage, plus secure book and magazine storage. With reasonable skill and a few hand and power tools, anyone can do it. With a 6-foot-high bow, our Duffy 37&apos;s lobster hull sheds active seas nicely. At our normal 17.5-knot cruise speed, the bow rises a bit. Forward visibility is no problem for me, because I&apos;m 6 feet tall. But Kathy is nearly a foot shorter than I am, making it difficult for her to see ahead. So I built a teak step stool for her. It is 10 inches tall, 11 inches wide, and 18 inches long, and she uses it at the helm. Problem solved! When we&apos;re in port, the step stool does double duty as a boarding step. Crossing the aft cockpit coaming is much easier with the help of the 10-inch step. For this project, I bought a single teak board, 9 inches wide, an inch thick, and 72 inches long. Then I cut it into lengths: 16 inches for the top, two 11-inchlong pieces for the legs, and a 27-inch section that I then cut lengthwise to create a leg brace and edge pieces to surround the top of the stool. Assembly was fairly simple. I attached the edge pieces to the top piece with glue and countersunk screws, forming a structure that looks like an upsidedown box. Then I notched the legs to fit into the top&apos;s underside. To reduce weight and bulk, I removed a 3- inch square from the bottom-center of each leg and rounded the edges of the cutouts. Finally, I cut the cross-brace to length. It fit snugly between the two legs, just above the cutout, and added lateral strength and stability. I secured everything with countersunk allweather deck screws. After inserting and trimming the teak plugs, I glued three narrow nonskid strips to the top. Two coats of teak oil, and the job was finished! Every boat needs something. Why not make some custom improvements to your home on the water? You&apos;ll feel pride and satisfaction in a job well done, not to mention you&apos;ll have bragging rights when visitors are aboard!